Man, it's been two years and a half years since the release of Home Run in Berzerk Land, and you would have thought that by now we would have developed a way to physically slap annoying people over the web. Oh well, as usual, our dreams far outpace our technology. But if you'd still be interested in taking out a little rage by using a cricket bat to launch a facsimile of a fellow internet user into the ionosphere, then it's nice to know that Berzerk Studio still has us covered: Berzerk Ball 2 is the latest in the series of action games that demonstrates how hitting-stuff-with-other-stuff will never get old. After choosing your character, you will be presented with a geek to launch. Using the meters, click to determine the power and angle of your launch. Once airborne, your character will have a certain number of Power Smashes, activating by clicking. These smashes will give the geek a little more speed with a Meteor Attack, or, if close to the ground, smash him up to the sky with a Hell Raiser Various obstacles will either slow the geek down or blast him further. Your distance will determine how much XP is added, with each leveling up granting you skill points to distribute amongst various stats. Crushing obstacles will earn scrap to be spent on various weapons and stat-boosting items, as well as regenerating your power smashes. Crush enough stuff over several launches, and you'll fill up your Rage Meter to unleash a super attack. Reaching certain milestones will unlock minigame challenges. Do well enough on those, and soon, other members of your team will make an appearance during launches to help you out in various ways. Earning achievements will give you precious metals, which can also be earned at a Daily Spin. These metals can be traded at the blacksmith for random quality items. The more you play, the more customization there is, and Berzerk Ball 2 is definitely a game designed for the long haul. For a game with such slam-bang action to it, Berzerk Ball 2's pace is surprisingly methodical. Every time it seems that all the game's wrinkles has been revealed, and that it's about to fall into that old launch game pattern of upgrades and clicking, a new element, a new feature to unlock becomes apparent. No doubt this unlocking is a little slow at first, which is sad since the earliest bits are the most familiar. Those who stick with it, though, will find it very much worth their while. Admittedly, the presentation of Berzerk Ball 2 is as jam-packed as its content. It seems to be a game which was created within the limitations of mobile device screens, and sadly does not take advantage of the larger resolutions of the browser window. Things definitely get a little cramped. Not so much that it affects gameplay, but it can be a little overwhelming to the senses. That said, it's hard not to like Bezerk Ball 2's addictive gameplay and gleeful biting-the-hand sense of humor, and, when it comes to dealing with the frustration of dealing with dismissive online malcontents, it's a much healthier option than putting your fist through the monitor. 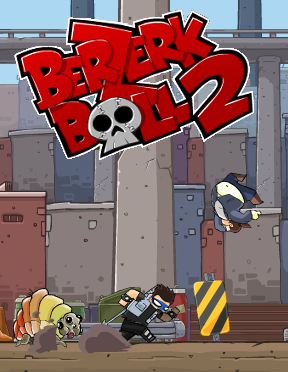 Berzerk Ball 2 Walkthrough now available! In general, the best strategy is to launch your geek, then click for a Hell Raiser right as he is about to hit the ground, then repeat as you refill your smash meter. Letting him hit the ground even once will cause him to lose a lot of forward momentum, so unless he is going to bounce off of a creature, keep him juggled. As you level your skills up, eventually you will be able to smack the geek off the top of the screen fairly regularly. When this happens, he will come streaking down like a meteor, with a bit more forward speed. When he hits the ground in meteor mode, he won't lose any speed, so you should wait for him to do so before smacking him up again. Going for the speed achievements will get you some nice precious metals. However, it will probably be best to do so in a launch just for that purpose. Repeatedly use Meteor Attack to boost his forward speed, using Hell Raiser only when he's close to the ground. If your rage meter is filled, use that too. Your flight will be a relatively short one, but fast indeed. Be sure to upgrade your stats strategically, though keep in mind that you can spend scrap to redistribute your upgrades when you need to. For instance, the "Crazy Collector" stat will help you find more scrap and XP. This is very useful early on. However, as your team becomes more and more upgraded, and you run out of things to buy, you should redistribute the upgrades to other stats. By contrast, the "Party Animal" and "Like a Boss" stats affect how often your team-mates assist you, and how well. However, they will not show up at all until you've unlocked them through challenge mode. Wait till you've unlocked your helpers before boosting this stat. Their help will be vital to clear the last region, though. There are few advantages to hoarding precious metals. The more you trade in to the blacksmith, the better items you will get, as he earns more and more XP. Occasionally during a launch, your geek will smash into a spider scurrying about on the ground. When this happens, check your inventory: these special spider tend to be high-powered, if a little randomly so. Burrito Geek, the fourth unlocked challenge, requires you to keep up the geek's forward speed in order to smash through walls. If he's not up to 200 mph, he won't make it through, so be ready with a Meteor Smash as you approach each one. Learning to Glide, the fifth unlocked challenge, can be a killer to finish. The challenge ends as soon as the geek hits the ground, and you are judged by the time he remains in the air. However, if he goes too high, he'll change into a meteor, and there's nothing you can do to keep him smacking into the ground. If you are having trouble, first, notice that when you use a Meteor Smash here, that the upward speed will be halted, allowing you to change in the desired range. Also, it may help to downgrade your equipment a bit: you don't want something that will smack the geek too high. If all else fails, redistribute your stats to take away "Creep Magnet" and "Rebound Master" since these will send you higher when you don't want to, put some point in the "Iron Man" stat to make your smashes regenerate faster, and select Bed as your Smasher. You'll get it soon enough! If you get impatient as you gain XP and scrap after a launch, clicking the "Map" or "Again" button will skip the animation without taking you away from the review screen. [? ], [? ], [? ], [? ], Left, Right, Left, Right, B, A, Select: In a single launch, do two "Hell Raisers" followed by two "Meteor Smashes"
One is Silver and the other's Gold...: Equip one gold and one silver item you've purchased from the store at the same time. Girls Around The World: Dress the Geek in the princess costume (once you've unlocked it in the challenges), and launch him using V-P, the female member of the team. Tricky pretty much said everything you will ever need to know but I have a few other tips. Spoiler because some people like to learn for themselves. -I recommend using the Hell Raiser trick noted above by Tricky, not only it is actually useful on this game compare to most but it increase your height AND speed, best of both worlds making the Meteor Attack the weaker choice here. Use the rage meter just like you would use the Hell Raiser, in the case of having both ready I recommend using the rage attack first as it is generally more useful while refilling then it is having it full for too long. With that said if you have full stamina then use the Hell Raiser about twice so they can fill while your Geek is on fire by the rage. -Do not worry about challenge rewards. The challenges also have a level which for a 100% completion is a pain as it will require some grinding. No doubt you will get the reward by pure luck alone if you are planning to max the challenge level. -There a limit of how many weapons and such you can have so trying to unlock all of the weapons is pointless and don't give any kind of reward. With that said the blacksmith and spiders can make items that easily outclass anything in the shop so try to buy as little as possible from it. -While the game seem to support facebook stuff and even buying stuff with real cash, the game is really pretty casual. You can earn anything the game offers and the facebook stuff rewards are honestly not worth it unless you want to do it. A bronze bar is something you can buy yourself after a single launch later in the game for example. -All of the upgrades from leveling is pretty good though it is worth noting that Bruiser only increase something that you may use only three times max in a launch endgame. Even if debatable of how useful it is you really should use it to increase your max speed and save yourself a Hell Raiser during launches when you have the rage meter for it, I just don't find it worth leveling personally. -Nothing in the air hurt you while there is one thing on the ground that does. Stay in the air when possible. Fun game and one of the few that can have so many features without lagging my old computer. Quite amazing. This game is really boring. I don't get it why people so like. And here is main issue I don't like about this game - when I hit the geek it's like a 2 different screens. No connection between. I hate this most. It seems the items need to be of the same type. I got the achievement with a silver poo statue and a gold poo statue. I tried equipping silver lucky coins and a golden poo statue before that, but it didn't work. I found this game to be nowhere near as fun as the first. After playing for hours I still hadn't made much progress and only came close to the third zone once through sheer luck of the creep layout. The air smash would've been a nice addition if it weren't so weak, and the not having to time the ground smash is nice but it seems pretty weak as well. I love this game. I play out on my RAZR Maxx and it's great. Starts alike slow but now I'm hitting an average of 900k distance and about 1100 speed. Max was just under 1.1 mil and around 1450 speed. - The maximum Blacksmith level is 25. - The maximum value for any one skill bonus in an equipment is +10 (you can have an amulet with three +10 bonuses, each to a different skill, at best). For weapon power I don't know, but I have made a weapon with over 300 power at Blacksmith level 25 and with a gold bar. With bronze bars I get around 250. - The maximum bonus obtained through equipment is +15. So having two items giving +9 Creep Magnet is a bit of a waste, as that sums up to +18 and the three extra points (from 15) do not help. If you add up 5 points from leveling up and 5 points from a character's innate bonus, you have 25 at best. - This tip is a sort of a cheat. You spin the Wheel of Steel to get a free metal bar, and normally can only spin again at midnight of that day. However if you set the date of your mobile/PC to one day in advance, you can spin again (you might need to load a different screen, then go back to the main map for the wheel to appear). Then just set the date to the correct day and you can spin once again. Repeat this for as long as you like.